New Rep Presents Jeffrey Hatcher's "Three Viewings"
New Repertory Theatre, in residence at the Arsenal Center for the Arts, will present "Three Viewings" by award-winning playwright Jeffrey Hatcher from November 27 - December 18 in the Black Box Theater. The production will be directed by Jim Petosa. 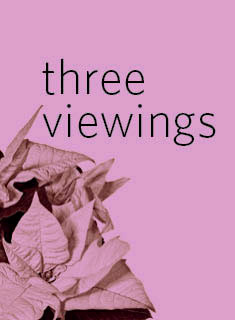 In "Three Viewings," Hatcher explores love, money and loss in a trio of witty narratives. An infatuated man goes to extraordinary lengths in order to win a woman’s heart; a jewelry thief with a hidden secret reclaims a family heirloom; and a widow confronts the repercussions of her late husband’s wheeling and dealing. Hatcher weaves these three poignant tales into an evening of storytelling designed to entice. The cast features New Rep favorites Joel Colodner and Adrianne Krstansky along with Christine Power. Hatcher has had his worked produced on Broadway, off-Broadway, throughout the United States, and abroad. His plays include "A Picasso," "Scotland Road" and "Compleat Female Stage Beauty," as well as adaptations of "The Turn of the Screw," "The Government Inspector," "Dr. Jekyll and Mr. Hyde," and "Tuesdays with Morrie" (with Mitch Albom). For information and tickets, stop by the box office at 321 Arsenal Street in Watertown, call 617-923-8487 or visit at www.newrep.org. Free parking is available in the six-level garage adjacent to the theater.